Disney made two significant announcements pertaining to the presence of Star Wars in Disney World during today's Parks and Resorts presentation at D23 Expo in Anaheim. The official name of the new land was announced, but opening dates were not. It was noted that the land will open first in Anaheim, then later in 2019 in Disney World. The lands will be essentially the same in Disney World and Disneyland, differing only in how you enter the area. The land will contain two attractions and at least one dining option, the cantina. The area will be populated by characters (including some droids), some familiar and some new, that will interact with you, supposedly based on choices you make during the attractions, and perhaps elsewhere in the new space. Disney released a video exploring a model of Galaxy's Edge, while Inside the Magic also have video of the model that includes an interview with Portfolio Creative Executive at Disney Imagineering, Scott Trowbridge. Trowbridge appeared during the Expo presentation and repeated a lot of what he told Inside the Magic. The attractions both sound pretty ambitious. In one, you will pilot the Millennium Falcon, though it's not clear how that will work. It was suggested that it's possible to crash the ship, so guests will clearly be able to effect the ride experience, though Chapek also noted "everybody works as a team," which I interpret as "everybody in a particular ride vehicle will have the same result." One of Disney's talking points during the Expo has been that you will be commended for successfully completing a mission here, presumably by walk-around characters in the park or in restaurants, but if you fail you may lose galactic credits, then you might upset someone and find that bounty hunters are out to get you. 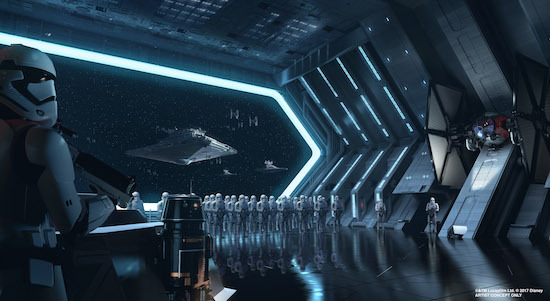 The second attraction will take place inside an Imperial Star Destroyer. Not much was said about this attraction beyond that, but the ride vehicle was revealed among the Expo exhibits. WDW News Today has a variety of photos of the First Order Fleet Transport. The vehicle suggests this will be a trackless ride system, which Disney has used effectively as part of attractions in different overseas parks. This adds a level of unpredictability, as you don't follow the same path each ride, so you will likely see and hear different things each time you visit. Galaxy's Edge will also include what was only described as "the cantina," which would suggest it will be evocative of the cantina from the original Star Wars film (now Episode 4). A face familiar to Star Tours fans will appear inside this dining establishment, as Captain Rex, the original pilot from Star Tours, will work as the DJ. Those who remember Rex know that he has a habit of making mistakes, and it was implied that is likely to continue in his new role. Not much else was said about the cantina, except that blue milk will be available. No other attractions, dining, or merchandise locations were announced. The only other specific entertainment (of sort) that was mentioned was a character with whom you can trade items. This sounds similar to the experience Jawas have offered in Disney's Hollywood Studios in recent years, though on a larger scale. I didn't catch the correct spelling of the name, but I believe Trowbridge referred to him as Dak Andar. Within Galaxy's Edge, there are to be three distinct areas, a resistance outpost, a bustling trading post, and an area occupied by the First Order. 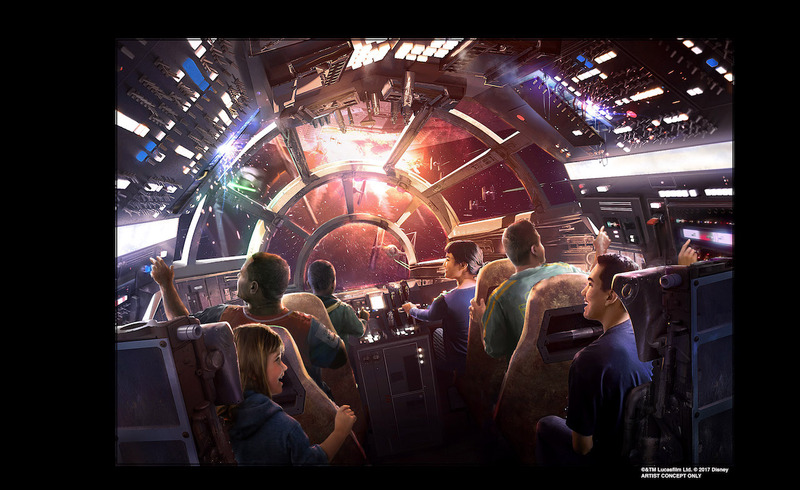 Generally speaking, Trowbridge described Galaxy's Edge as a "stepping off point for adventures." 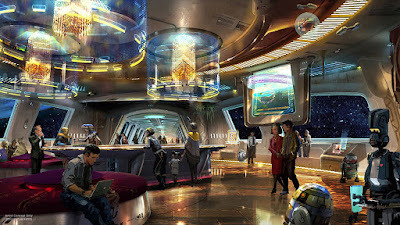 It is clear that Disney intends for there to be much more to your Star Wars land experience than just riding attractions and eating food, as walk-around characters (human, alien, and droid) are supposed to interact with you and be familiar with the reputation you have earned. Presumably, this will be done by tracking your MagicBands or RFID tickets that will notify these characters what you have done in the land and how successful you have mean, which will further add to the unpredictability that the two attractions will offer. Trowbridge added that you will create "your own adventure." If Disney is successful in integrating attractions and other experience, then it will set a new standard for what is possible in theme parks in a way we have not seen since a long time ago. Avid Disney Parks fans may have heard about this idea in April, when concept art from a Disney guest survey made the rounds on social media. 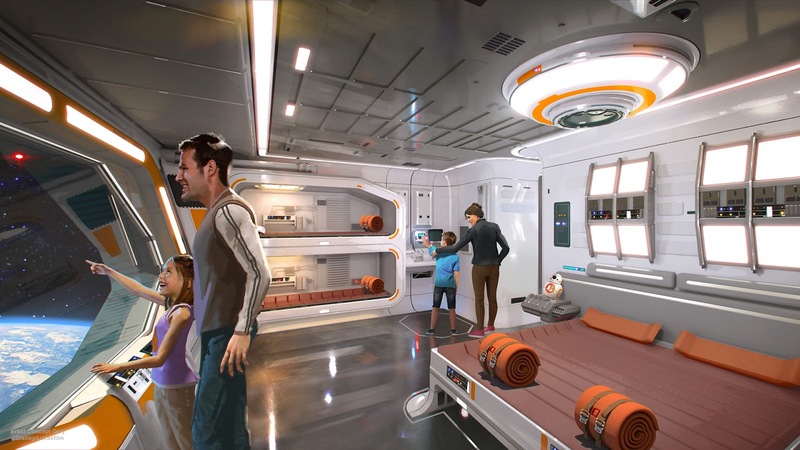 Today, Disney officially announced a Star Wars resort will be built in Disney World, but did not say much else. In April, speculation was that the new resort will be near Disney's Hollywood Studios, but no official announcement was made about the location. What we do know is that the resort will make it appear as if you have stepped onto a starship and everything you encounter should further that theme. One noteworthy item was that Bob Chapek announced, "every window has a view into space." This suggests no actual windows into the real world (which would disrupt the theme), perhaps something akin to the popular virtual portholes on the Disney Cruise line, though on a larger scale. Chapek described the overall experience as "100% immersive," which doesn't mean a whole lot (except to serve as further proof that Disney believes it important to describe every initiative in their parks these days as "immersive"), but does suggest this will be more than just a hotel that looks like something you might see in Star Wars. 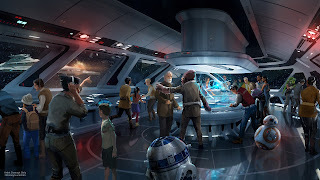 In a similar manner to how characters are to react to your choices inside the new Galaxy's Edge land, it sounds as though the characters you encounter at this resort may do the same. Chapek said the experience "will culminate in a unique journey for every person who visits."